Fukushima radiation continues to increase along the coast of British Columbia, yet remains well below levels known to be a considerable ecological and health risk, according to the latest monitoring data. The new data, collected between October 2017 and May 2018, are from samples collected through our citizen science monitoring network in sixteen coastal communities from Victoria to Lax Kw’alaams. The most recent data available from May 2018. To look back through October 2017 – present, visit the map on the homepage. The sample with the highest measured activity of cesium-137, the longer lived of the two Fukushima radionuclides that we monitor, over this eight month period was collected in Tofino on December 18th, 2017. At 4.8 Bequerels per cubic meter (Bq m-3, 1 Bq = 1 Becquerel is one radioactive decay per second, named after Henri Becquerel who discovered radioactivity), this sample had the highest measured activity of any sample since the initial coastal detection from Ucluelet back in February, 2015. That said, this activity is still far, FAR below the 10,000 Bq m-3 Action Level that is set by Health Canada’s Radiation Protection Bureau and is even well below those levels that were seen back in the days of atmospheric nuclear weapons testing. It’s good to keep these historic and benchmark levels in mind when the data could also be framed as “new monitoring shows radiation at a 500% increase over pre-Fukushima levels”. This is a true statement, but it is misleading without context. Publishing eight months of new data as a block allows us to take a closer look at the evolution of the observed signal. While it is clear that the monthly average of these data has increased a significant amount since monitoring began, it is less clear if that rate of increase is continuing at the same pace it once was. Looking at just the data from late 2016 to the present, they seem to follow a much more jagged path compared to those from 2015 through 2016. Could these be evidence of passing radiation “pockets” that experienced more or less mixing along the long oceanic journey across the Pacific? Will the long-term trend continue upwards? This would support the continued use of a linear trend. Or, is it possible that since late 2016 the signal has been approaching the peak and will soon be declining? This leveling off would support the parabolic trend. 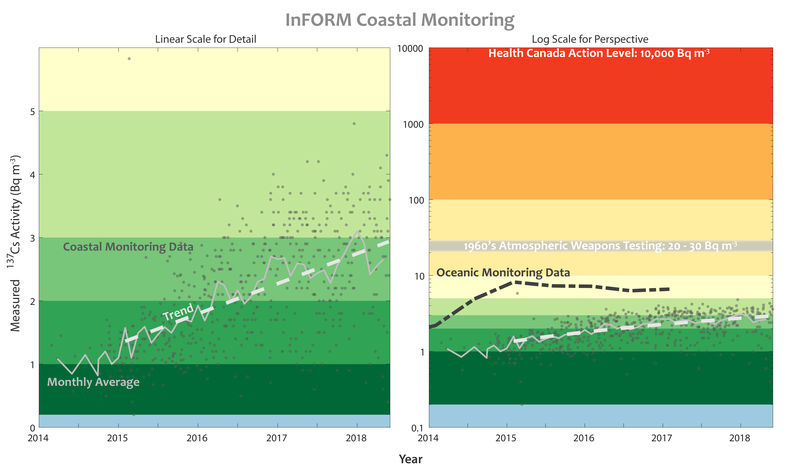 From our oceanic monitoring efforts we know that the peak concentrations will be less than ~6 Bq m-3 so perhaps this is just the beginning of that leveling process. Only continued monitoring will prove which trend is the most accurate representation of these data, so we’ll just have to wait and see. I want to end this update by explaining and personally apologizing for the lengthy gap between updates. I began another full-time job in April 2018 with the full support of the InFORM team. My new work has kept me quite busy. While I have been able to help keep InFORM samples shipping around the province, and even regularly do data entry, the time to sit down and compose a full update has eluded me. For that I am sorry to the citizen scientists, supporters, and followers. I have data in hand for both the oceanic and biotic monitoring that I need to write up (don’t worry, no major surprises) and those will be coming as quickly as my obligations allow me to. Thank you for your continued support of this meaningful work that I have truly enjoyed.